President Preval called the nation to three days of prayer and fasting starting on Friday, marking one month after the earthquake that devastated Port-au-Prince, Leogone, Petit Goave, and Jacmel. At the clinic we started on Thursday with a time of prayer and reflection, using the acrostic A.C.T.S. (Adoration, Confession, Testimony and Supplication). It was well attended by both staff and patients alike. On Friday, the clinic was closed for all but essential services. 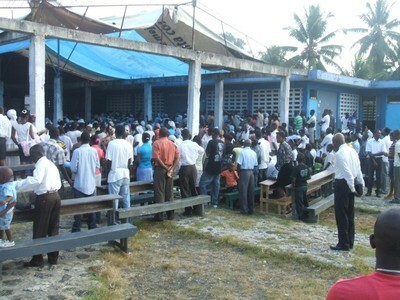 Quite a few churches in PAP organized a united Fond-des-Negres Community Prayer Service, held in The Salvation Army primary school courtyard. The services began at 6:00 AM and ended each day around 12:30 PM. 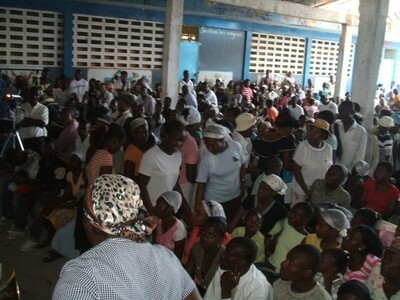 There was a crowd of 2,000+ each day with the crowd spilling out into the school yard. There weren’t enough chairs so many stood for 4 to six hours, quite a few in the full sun! At the end of Friday’s meeting they encouraged people to come with their own chairs and umbrellas. The day was divided into sections with different pastors being responsible. There was a lot of very lively praise & worship which rose to a frenzied pitch. I filmed some of it but unfortunately, my camera can’t record sound. An offering was taken up each day to cover the costs of the gas for the generator, water for the crowd, etc. With the lack of space to move around, I didn’t think many people would want to bother to squeeze out of their space to go forward to drop their offering in the basket. It was amazing to see people do just that and line up to make their contribution. 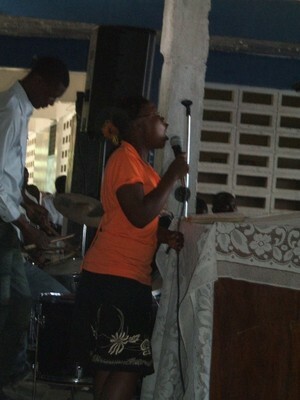 On Saturday, Katianna from the SA Bethany Children’s home did the solo during the offering time. On Friday, 151 people responded to the call to accept Christ and on Saturday, the alter call was given BEFORE the final message of the morning and 100 people came forward. PTL! On Sunday there was rain during the early morning hours so it got off to a late start but by 9:00 AM the rain had stopped and the crowds gathered. 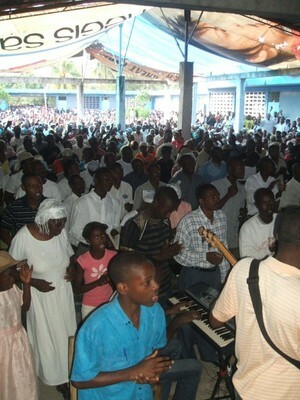 One song that touched my heart the most out of all that were sung is almost a national hymn among protestant Haitians. It is in French so maybe some of you will understand it without me translating it. Nous trouvons le seul vrai bonheur. Il nous a marqués de son sceau. Haïti pour Christ à jamais! Wow is all I can say!!! Praise the Lord for what He is doing within the lives of those there. 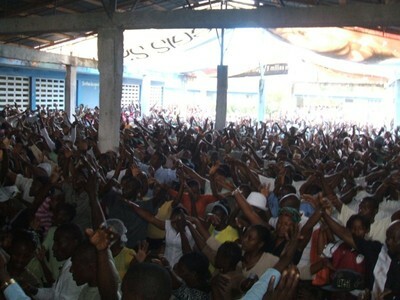 I join in prayer with you for the people of Haiti. I pray that He will be Lord over Haiti and more lives will be won into the kingdom. What a blessing to read this today. It has encouraged my heart. Thank you for what you are doing and what Felix is doing there. May God continue to bless your ministry. God bless you!!! Oh, Violet. What a powerful, beautiful, moving post. Thank you for sharing – not just about what The Salvation Army is doing and what the country is doing to move forward, but for sharing the number of people who have come to Christ!!! Oh, my heart is just rejoicing! Keep us informed, and know we continue to pray.